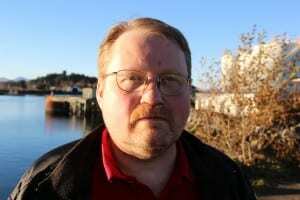 Sitka’s got a new public library director who knows he’s got some big shoes to fill. But Robb Farmer calls himself an ideas man, and he’s looking forward to maintaining the momentum of Kettleson Library’s best programs, while introducing some of his own — including backyard chicken farming and library speed dating. Kettleson Library will host a housewarming party this Sunday at 2 PM, with refreshments and exhibits. A formal program about the expansion will take place at 4 PM. Robb Farmer spent the last nine years at the Faulkner University Law Library in Alabama. He’s a lawyer himself, but says he enjoyed legal research more than the actual practice of law, and he found a way to stay in the library full-time. Farmer had never seen or heard of Sitka. He checked out the listing. Of course, Sitka is spectacular. Those keywords, though, spoke volumes. Betting on humor, Farmer sent in his application, was invited to interview via Skype, then flown to town for in-person interviews. Farmer says that once he saw Sitka, there was no question that he and his wife, Kathy, would move here if he got the offer. He did. He took over for Sarah Bell on October 1. Farmer runs through everything that’s been happening at Kettleson lately: The recent teen programs, national novel writing month, and some things that are planned — like a poetry event, backyard chicken farming, and birding. I know libraries have changed a lot over the past two decades, but this catches my ear. KCAW – What did you say about chickens a minute ago? Farmer – Chickens? Well that was a tentative program idea coming up probably in the spring. I’ve noticed that there’s a lot of backyard chicken farming around here. We have some materials on that. We have books on the subject, magazines on the subject, and I think it would make an excellent program for people who might want to do that to have people who have done it successfully to come and talk and explain how it works. Farmer hails from Appalachia, originally Danville, Kentucky, but spent a lot of time in Louisville. He says he doesn’t have the slightest idea how to raise chickens. But he does understand libraries, an understands that they are changing. The mission is to circulate information, in whatever form. The library is currently housed at the Stratton Library on the Sheldon Jackson campus while the Kettleson facility is renovated. The plan is to expand the original building by 60-percent over the next year, and to develop its role as a community gathering space. Farmer says the physical reality of a library is really important. And if Farmer’s plans come true, Kettleson is going to be really alive. Farmer – I’ve got ideas for the future. I’ve got this crazy idea for Library Speed Dating come February, and stuff like that. We’re going to see what works, and if it crashes and burns, that’s okay. Farmer’s wife will move to Sitka in January — before the speed dating event. For pastimes, Farmer says they enjoy walking their dogs, and reading.